Lampedusa, the largest of the Pelagian Islands, is the southernmost part of Italy. The other islands of the archipelago are Linnosa (known as Aethusa to the ancient Romans) and tiny Lampione (literally “big lamp” for its lighthouse). 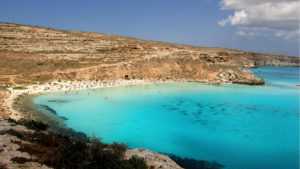 Larger than Pantelleria, Lampedusa lies in the Sicilian Channel 205 kilometers south of the Sicilian coast and only 113 kilometers from Tunisia – and 150 kilometers from Malta. There are around six thousand permanent residents. The island was a fief of the Tomasi family until the middle of the nineteenth century. On Lampedusa there are military facilities and a small prison, as well as facilities for refugees who frequently arrive by boat from Africa, but it is nevertheless an attractive holiday destination. It is reached by ferry service from Porto Empedocle outside Agrigento. There are regular flights, with more frequent service in summer. Lampedusa’s best public beach is Spiaggia dei Conigli. Others are Cala Maluk, Cala Croce, Cala Galera and Cala Greca.